The Dr Otto Rodriguez San Pedro PolyClinic II has been equipped with three health support vehicles that will serve as ambulances on the island. The small three-wheeled motorcycle-type mobiles, widely referred to as Tuk-Tuk (Auto rickshaws) ambulances, are part of the batch of 26 that were donated from Dubai, United Arab Emirates. The support vehicles valued at $300,000, were handed over to the Ministry of Health on Monday April 14th and on hand for the occasion was Pablo Marin, Minister of Health. According to a release from the Ministry of Health, the donation was secured by the Minister of Tourism, Civil Aviation and Culture Manuel Heredia Jr., and the Attorney General and Minister of Foreign Affairs Wilfred Elrington. “The health support vehicles are three-wheeled motorcycles with an attached covered unit equipped with seating and a stretcher to transport patients. The vehicles will not be used as a replacement for conventional ambulances, but will support the Ministry in the transportation of patients for healthcare services and coordinated assistance with our partners at health promotion events, social events, mobile clinics use and home visits. The vehicles will be distributed to, priority regional and community hospitals across the country where there are transportation and logistical challenges; and also to areas that have a more dispersed high risk population group,” stated the release. Three of the vehicles were sent to the public health facilities on Ambergris Caye, while one is going to Caye Caulker. While it will not replace conventional ambulances on mainland Belize, on the two islands they will serve as such since none of the islands have an ambulance. Speaking to the press at the event, Heredia said the tuk-tuk ambulances are perfect for the island’s need. “After they were assembled, I can see that they are perfect for the needs that we have. They are not sophisticated, but it is something that can bring more comfort to tourists or our locals, up north or down south of San Pedro and including the area like San Pedrito, San Juan and downtown San Pedro. So I am much appreciative of the embassy, and also Minister Elrington who was instrumental in making sure they arrived over here properly,” stated Heredia. 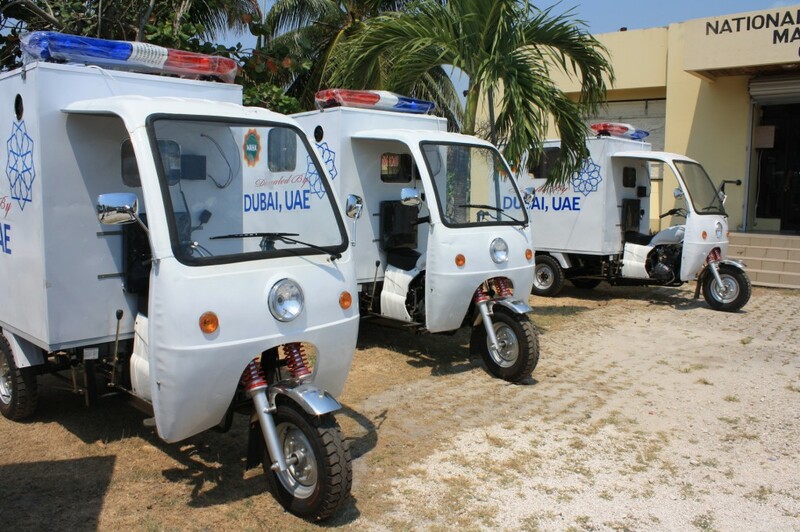 The mobiles have a 250 cubic centimeter engine comparable to LiFan motorbikes and have a lifespan of between three to five years in good environmental conditions.